Today, Royal DSM opened its new center for research into and development of high-performance materials on the Brightlands Chemelot Campus in Sittard-Geleen, the Netherlands. 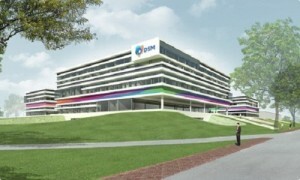 The completion of DSM’s largest materials center worldwide is part of the €100 million investment in knowledge and innovation in the Netherlands that DSM announced in May 2012. The center employs over 400 knowledge workers and combines important technological skills and expertise unique in the Netherlands for use in applications the world over. The new state-of-the-art center was officially opened today by Dutch Economics Minister Henk Kamp, together with Theo Bovens, Governor of Limburg Province; Dimitri De Vreeze, member of DSM’s Managing Board; Roelof Westerbeek, President of DSM Engineering Plastics; and Atzo Nicolaï, President of DSM Netherlands. Another example: Dyneema®, the world’s strongest fiber is at the same time extremely light and flexible and has many innovative applications, for instance in cut-resistant gloves, shipping ropes and bullet-resistant vests. DSM is always on the lookout for innovative new applications for this fiber, one example being an automatic tsunami barrier. The barrier could be installed along the coastline anchored in a trench behind the beach. When the tsunami tidal-wave arrives, the force of the water immediately causes the membrane with Dyneema® to unfold, while a float drags it upright. The float is kept securely in place with Dyneema® cables. This rapidly creates a high wall stopping up to 20 meters of water, thus preventing casualties and material damage. Dimitri de Vreeze, member of the Royal DSM’s Managing Board: “This investment is perfectly aligned with our strategy for growth in Materials Sciences through innovative solutions for a more sustainable future for people today and for generations to come.